You start with a small plastic flowerpot. These can be purchased at Michael’s and Hobby Lobby, but I’m a lazy online shopping fool, so Amazon got my money. Really, they always do. My husband started working from home last year and the volume of Amazon boxes delivered weekly to our house was the only hiccup in an otherwise smooth transition. I think he may have suspected a little something was going on between me and the UPS guy. Probably he just saw dollar signs flying out the door every time I opened it for another package retrieval. My shopping habits are beside the point. Let’s get back to making these fabulous desserts shall we? Take your adorable little pots and give them a wash in soapy water before the food hits them. Then we start with a layer of cake. Now, this can be as homemade (or not) as you’d like it to be. I used Sara Lee frozen pound cakes, sliced into long strips and then cut out a circle with a biscuit cutter. For some gluten-free ones, I used gluten-free cupcakes and sliced them into thirds to squeeze into the bottom. The biscuit cutter worked PERFECTLY! 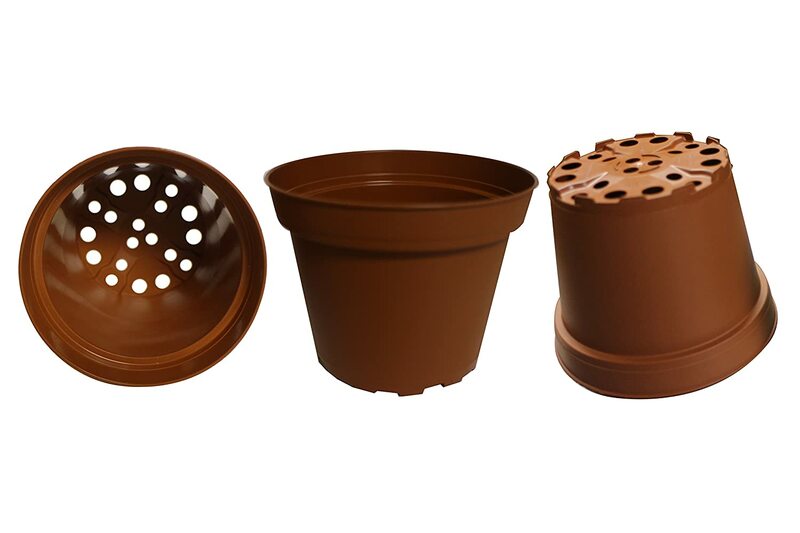 Once you have all your cake pieces down in the bottom of the pots, we need to create a place for the stem of the flower to go. So, get yourself some straws and cut them just slightly longer than the height of the pot. Push each straw piece into the middle of the cake. I highly recommend making these on top of some kind of big rimmed cookie sheet. That way you can easily transport them to and from the freezer all together. Next comes the ice cream. I just purchased a big tub of vanilla, but you certainly can make these any flavor your little heart desires. I didn’t want the hassle of trying to remember which flowerpots held which flavor when I handed them out, so I made them all the same. You’ll be getting very cold and sticky hands during this part. The sacrifices we make for adorable food huh? It’s a race against the forces of time and heat as you attempt to get all the pots filled before your permanently stick together and your ice cream turns to soup. This is not a job that needs any kind of perfection. We are going to cover up that mess with some “dirt”. Pop the ice-cream filled pots into the freezer to let them firm up while you give some Oreos a good whacking. Pulse up the cookies in your food processor if you don’t have any anger issues. As for me, I find it incredibly cathartic to slap some cookies in a ziplock bag and bang the crap out of them with a rolling pin…or a good heavy bottomed pot. Spoon the crushed Oreo dirt on top to completely cover your sloppy ice-cream, but be careful not to fill in the straw. Put the flower pots back in the freezer until you are ready to serve them. Then finish it off with a lovely flower. If you are making these pots for boys, skip the straw, fill the whole thing with ice cream and put some gummy worms under/in/on top of the dirt. Once the flower is in, you can spoon a little more “dirt” on top to cover up the straw. Perfection! A garden of deliciousness!